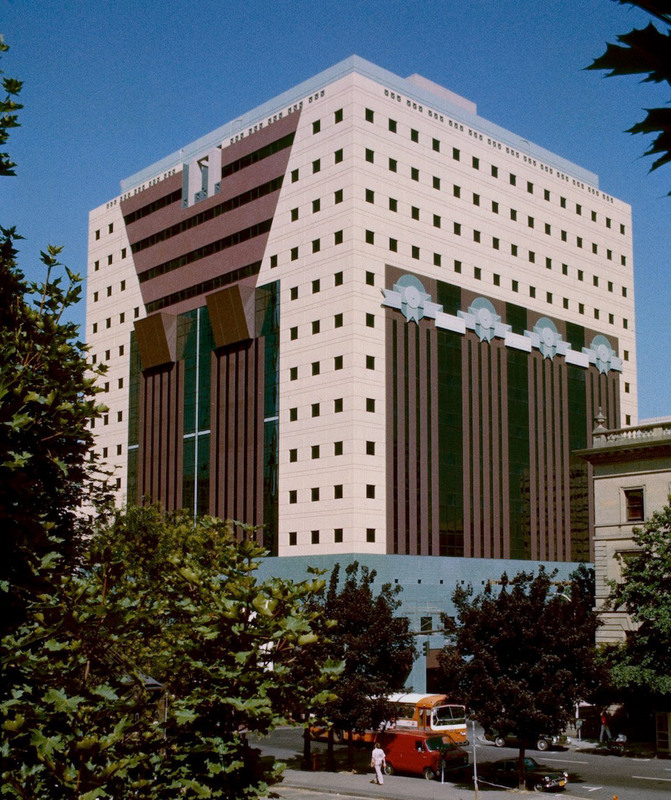 Construction has begun on a contentious weatherproofing, renovation, and seismic retrofit plan led by architects DLR Group for the Michael Graves–designed Portland Building in Oregon. The $195-million plan started with the simple aim of halting persistent water infiltration issues. However, as the scale of that investment became clear, Portland authorities found that it made more sense to completely overhaul the tower so that it might be fully retrofitted for improved and adaptable long-term use. The project now aims to extend the life of Graves’s iconic work by 50 to 100 years, an effort that involves the controversial act of reskinning the 360,000-square-foot tower with a unitized aluminum rainscreen and adding a reinforced concrete shear wall through the building’s core. This wall will be supplemented with steel reinforcing to bolster the tower’s seismic resiliency, among other features. Built on a minuscule budget in 1982, Graves’s bold, competition-winning concept was value engineered into submission as it was erected. Cost-cutting efforts included the use of an exterior concrete structural system, an emphasis on humble materials, and the application of shallow-relief ornamentation, among other approaches. Shoddy detailing from the concrete wall system created the water infiltration issues, while also forcing Graves—who initially wanted to hang colorful stucco panels off the exterior walls in order to express the building’s iconic, historically evocative design—to instead opt for painting the bare concrete walls in colorful hues. 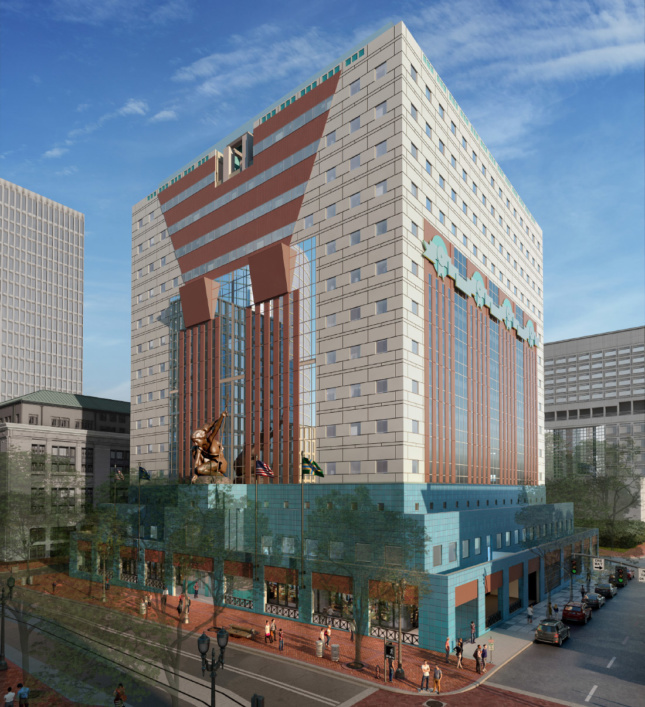 The designers plan to encase the 15-story tower in a new insulated and waterproof wrapper while also maintaining—and in some cases, implementing for the first time—Graves’s original intentions for the building’s facade. The building’s dark, square-shaped windows, for example, were installed for energy conservation reasons against Graves’s wishes and will be replaced with insulated clear glass openings. 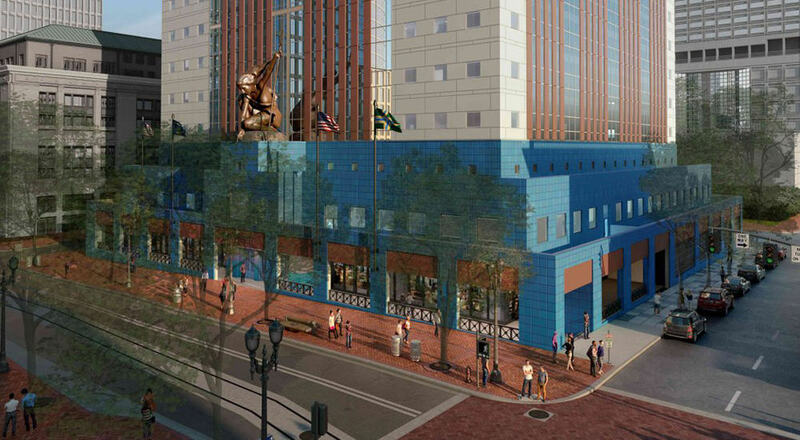 Other changes include updating the tile patterns at the building’s base to a larger, 2-foot-by-2-foot grid, closer to what was originally proposed. The plan also includes closing in and reconfiguring some of the unsuccessful ground floor retail spaces and an old subterranean parking structure. The changes have been controversial within the preservation community, and local authorities have acknowledged the seemingly radical nature of the plan, but the restorative scheme is deemed necessary to fully extend the life of the structure and improve its functions as a public office building. Initial partial demolition of the facade elements began in March of this year and construction has now entered full swing as ground floor areas are closed off and the windows are removed. The project team expects to complete the renovations by 2020.